Are you ready to communicate if phones stop working? Do you have HAM radio gear? Is that gear adaptable for use in base operations and mobile ops? Lets look at some good, entry-level gear, that can be modular, and will support your needs even as you become a HAM radio ninja! The key player in most new Ham shacks will probably be a 2 Meter radio. The radios listed below are mobile radios, designed for automobile use, but make great base stations. Since we’re about being prepared having 2 bands gives us more communication options, so a dual band, 2 Meter & 70cm radio, would make the most sense. Yaesu FT-7900R (or a FT7800 if you can locate one) – Mobile Dual-Band Amateur Ham Radio 50W/45W VHF/UHF Transceiver. In addition to being able to transmit and recieve on both 2 meter & 70cm, this radio has a 1200/9600 bps Data port (Packet Jack). This means you can send digital data to other HAM radio operators or connect to the internet via a HAM network! Yaesu FT-8800R – VHF/UHF Dual Band Amateur Radio Transceiver – 50W/35W. Simultaneous Receive of 2 Frequencies & Cross-Band Repeater Capability! I don’t think this has a data port. These radios are designed to be used as a mobile radio, therefore to use them as a base station they will require a DC power supply. If you use Anderson Power Pole Connectors and stout wiring to connect your radios in your automobile, and a RigRunner (similar to a DC power strip, with connections for Power Pole Connectors) in your shack, you’ll be able to quickly move your gear between your ham base shack and your vehicles. A ham radio is only good, if you have an antenna. To connect any ham radio to a dual band antenna you’ll need a reasonable length of good antenna cable. If you want to really reach out and maximize your 2 meter and 70 cm radios you’ll want to find a good base station antenna for the shack. If you plan on being on the move or need some flexible deployment options, a dipole antenna, like the Falcon 2 Meter Dipole Amateur Ham Radio Antenna (horizontal polarization) will give you some flexibility for mounting and positioning. This antenna can be hung from a hook, dangled out a window, or even strung up between 2 trees. This is a great option if you need flexible deployment options, or may need to move it to new positions quickly, but won’t give you the best transmissions, since you’d want vertical polarization for 2 Meter FM broadcasts. The car, being metal, is pretty much the equivalent of a Faraday cage, so if you want any type of good distance, you’ll need to employ a mobile dual band antenna, probably with a magnetic base, so you can move it from vehicle to vehicle. A handheld radio would also work for base station, vehicle use or backpack carry. 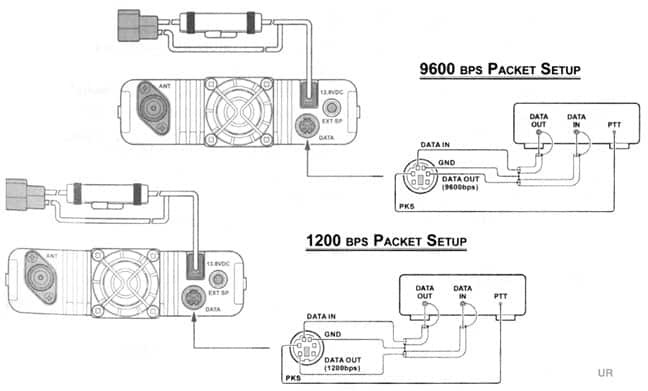 To connect to a mobile or base antenna, an adapter is needed because handheld radios use SMA connectors and not the standard PL-259 connectors. If you just want to upgrade the antenna on the BaoFeng unit, you can upgrade it with the ExpertPower 14.5″ DUAL BAND 144/430Mhz U/V SMA-F Antenna For BAOFENG UV-5R WOUXUN KG-UVD1P for a great increase in distance for transmit and receive. If you just want to upgrade the antenna on the TYT UVF1 unit, you can upgrade it with the ExpertPower 14.4″ Dual Band Two-way Radio Antenna SMA-Male for a great increase in distance for transmit and receive. TYT has a female connector and requires and antenna with a male connection. BaoFeng has a male connector, and requires an antenna with female connectors. This should give you some ideas to allow you to use a mobile 2 meter or 70 cm radio in your car. If you’re just getting started with ham radio, it makes sense to get the best bang for your buck and use gear that can be used in both base and mobile operations! Yaesu ft450d. This price blows everyone out of the water. Good article. I have bought items from the 409 shop in the past and alway have been happy with them. First off, the 10 amp power supply is not enough to run any of those radios. For instance, the 2900R draws 15 amps at 75 watts output, meaning a power supply in the 20 amp range is minimum, and something closer to double the amperage is preferred, to deal with overheating and surges for continuous duty. Secondly, you never want to run a transceiver like theses, which draw a lot of current, from your cigarette lighter. The wiring in your cigarette light is not heavy-duty enough to handle it. Also, it a good recipe for noise. That is in fact a couple of questions on the Technician exam. Always wire directly to your battery and car grounding post. You can buy quick disconnects for your wiring to move your transceiver from your house to car. And last, wire dipoles like the Falcon make lousy 2M FM antennas, because they are horizonally polarized and you want a vertically polarized antenna for FM, which is the mode you will be using most on 2 meters. Also, it is a single band antenna, so it does you no good on the 70 cm band, if you buy the dual band radio you suggest. Look out! It’s the license police! Maybe you missed the part about “when the phones go out”, ie: SHTF situation? Thanks for pointing out the obvious, Nathan. I love these comments. I love arm-chair theory crafting about SHFT and everyone becoming some radio genius suddenly with zero operating hours. Saying you don’t need a license to use a ham radio is like saying you don’t need a license to drive a car. It’s for *your* benefit, like knowing how to read signs, who goes first at a stop sign, why you don’t park your car on the tracks. It makes the roads safer as it sets some basic understanding for how to operate. All these idiots buying ham radios will be completely inept when the time comes, because actually operating a radio is non-trivial. Hitting the repeater is non-trivial. Getting a clear and easy to read signal to another station is non-trivial. Having a decent antenna is non-trivial. I have my radio on and I hear all kinds of garbage as people try and key up. Lots and lots of people underwater or in the mud. “Sorry, I can’t hear you, please try your call again later”. That’s gonna be you. Using a radio isn’t like a cellphone, where you just check for bars, punch in a number and it works. You are the phone company. You don’t practice it, it ain’t gonna work. Without understanding the theory behind it (I don’t mean just radio theory), lots and lots of people are going to have “radios” that talk to exactly zero other people. What frequency do you tune to? Where do you point the antenna? Who is going to answer? What would you say? What would you request? How do you relay info? To who? Imagine owning a phone and not even knowing to dial 911, that’s you. Getting a license at least teaches you that numbers like 911 exist, but even then you’d have to know what frequencies to program into the radio.